This book is your guide to best practices in understanding enterprise risk and business impact. It provides you with essential guidance for the identification, management and control of risks confronting businesses. What might happen? How will our enterprise be affected? What will the impact be? Answering these questions accurately and objectively is essential to Business Continuity Management, business success – and even business survival. More than ever, the basic lesson for business managers and for business continuity professionals is: anything can happen! 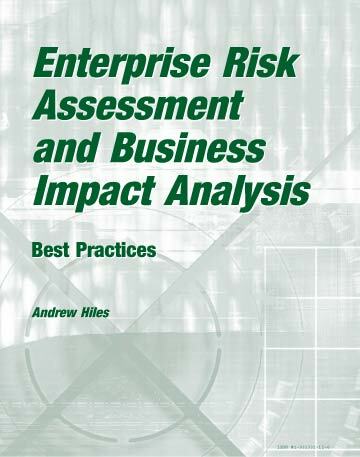 This book by Andrew Hiles is your guide to best practices in understanding risk assessment and business impact analysis. It provides essential guidance for the identification, management and control of risks confronting businesses. What might happen? How will our enterprise be affected? What will the impact be? Answering these questions accurately and objectively is essential to Business Continuity Management, business success – and even business survival. The helpful examples all have their roots in real cases and come heavily laden with pragmatism. Over fifteen years experience in blue chip environments, large and small, public and private, has gone into developing the methods described. Others come with a respected pedigree from a variety of industries.Your own right way for risk management means picking, matching and tailoring from the cases, guidance and examples provided, and building on existing best practice within your organization. Why This Book on Enterprise Risk Assessment and Business Impact Analysis? I was founder and Chairman of Survive, the first international user group for business continuity management. Survive gave birth to the Business Continuity Institute (the industry’s professional association). Both bodies were concerned with the issues of recovering from business disasters. Typically the recovery involved doing something different: alternate locations, operations, equipment, IT and telecommunications facility. It all implied a hiatus – an interruption, a period of uncertainty and disruption, before a semblance of normality was restored. The Business Continuity profession included the disciplines of risk management and an understanding of the impact on the business, should those risks actually occur. But then, so did many other functions within the business. Maybe the IT Disaster Recovery function was separate from business contingency planning. Operational Risk Management then had a fairly narrow role, typically looking at specific operational functions. Insurance was something else, often the remit of the Finance Director or someone called a Risk Manager who was, in fact, mainly concerned with insurance aspects. There was usually someone else responsible for compliance issues, while yet another person was accountable for health and safety issues. An audit function was responsible for fraud. Typically, the organization had no overall view of risk and no individual with overall responsibility for it: fragmentation was normal. Then, a few years ago, there appeared an emerging tide of acknowledgment that these risk-related functions should be brought together. The reason may not always have been logic: sometimes, it stemmed from downsizing and a putting together of these functions for productivity, rather than strategic reasons. For some, Y2K projects created a sense of urgency and an impetus that promoted this as pragmatic logic. Some companies had the vision to take a holistic approach to risk management and to create what we have come to call Enterprise Risk Management. We have been privileged to help a number of companies through this process and facilitate the creation or enhancement of their risk resilience: in short, helping them move from an expectation of disruption and subsequent recovery to a position where effective risk management all but eliminates the disruption. Several years ago, I was presenting a workshop on disaster recovery planning to an international audience and a German in the front row was looking increasingly puzzled. At the coffee break, I asked him if, perhaps, I was using unfamiliar terms or whether I was not making myself clear. “No,” he said. “I understand perfectly what you say. It’s just that, in Germany, we are not allowed to have a disaster.” Now, many years later, it is evident that he had a point. While we cannot legislate disasters, we can seek to minimize them. Of course, the unimaginable can always happen (as we have learned from recent horrific events) and we have to be prepared to deal with the human and business consequences of it. But increasingly foresight can prevent many situations that previously may have become unexpected disasters. This book results from a wish to share risk management best practice – not from the perspective of a theorist, but from a practitioner’s viewpoint. A classic title from Rothstein Publishing (2002), by Andrew Hiles, Hon FBCI. Risk Analysis and Business Impact Assessment is an area of Business Continuity Management that evokes a lot of discussion and misunderstandings. For many years, Andrew Hiles and Philip Jan Rothstein have talked about the need for a detailed book on this subject. Finally, their collaboration is meeting that need. Several years ago, I was an integral part of the group that developed the Common Body of Knowledge that was ultimately adopted jointly by the Disaster Recovery Institute International (DRII) and Business Continuity Institute (BCI). Subject Areas 2 and 3 of their Professional Practices deal specifically with Risk Analysis and Business Impact Assessment. This book relates directly to those sections as well as to Section 3-3: Hazard Identification and Risk Assessment in the National Fire Protection Association (NFPA) 1600 Standard on Disaster/Emergency Management and Business Continuity Programs. When I was asked to write this Preface, I did not anticipate any problems in accomplishing that task. However, I must admit that the exercise turned out to be more difficult than I had anticipated. The major problem was that the tragic events of September 11th, 2001, including the destruction of the World Trade Center and the cascading impact on not only Manhattan but the entire world, caused me to think, along with many other business continuity practitioners, whether any risk or business impact assessment could have anticipated such an incident and its impact. If it could not, then why should we bother to conduct such an analysis? I have heard others questioning the need for such an analysis. Having thought about this for some time, I am firmly convinced that the need remains as much as ever. While I certainly would not want to second-guess any analysis conducted prior to September 11th, I do believe we need to learn the harsh lessons from that event that apply to both Risk Analysis and Business Impact Assessment. The basic lesson for business continuity professionals is: anything could happen. The local impact could be catastrophic, and the cascade effect could be overwhelming. Is that really any different from what business continuity practitioners have always preached? Probably not, but it was often something that was not appreciated by senior management. Now, regrettably, we have the evidence to support this lesson. Perhaps the problem was not that people refused to believe that such catastrophic events could occur – after all, we have experienced other, recent catastrophic events such as earthquakes in the USA (Northridge), Taiwan and Turkey. Maybe it was more the case that the appropriate information and evidence was not developed and presented in a way that made it truly believable. I hear a lot of talk about worst-case scenarios, and that cold be part of this problem. Many business continuity practitioners concentrate on the worst case as a single event, but then the question becomes, “is that really the true worst-case scenario?” Or, because a single event is being considered, perhaps it is not extrapolated to the full extent, since to take it that far might strain its credibility. If a range of scenarios are used from the most likely in both type of incident and impact, through to the absolutely worst case, you can build for senior management a better and more believable understanding of what can happen. The other aspect in connection with risk analysis and worst-case scenarios is to make sure that you have the in-depth information necessary to support your points on what could happen. Too often, that in-depth aspect is missing and does not support the Risk Analysis findings. Another possible problem I often hear is constant reference to financial impact. While financial impact is important, it is not the only impact which must be considered. There are several others, such as public credibility, legal and regulatory issues, or credibility within the financial community, all of which should also be addressed. Many of these impacts will be difficult, if not impossible to quantify. This means that such impacts need to be qualified rather than quantified. The purpose of a Business Impact Assessment is to provide information for both decision-making and for incorporation into the business continuity plan. Spending considerable time on quantification of impacts when qualified impacts would be just as appropriate and useful, can not only delay the development of the business continuity plan, but can also reduce the planner=s credibility with management and possibly the effectiveness of the business continuity plan. Not only is a Business Impact Assessment a means for prioritizing functions, but also the means to identify the resources that are needed to support the functions and the priority order in which these resources should be provided. Resources range from space, people and equipment to outside services and utilities. Identification of such resources requires focusing not only on the details of the business production or service functions but also looking at the big picture of what is used outside the immediate area of such functions. Hence the need to pay just as much attention to such aspects as the supply chain, outside utilities and even the demographics and travel routes of the company staff. This is also where the Risk Analysis and Business Impact Assessment are linked. Remember the basic premise of the Risk Analysis and Business Impact Assessment: what can happen, what will be affected, and what are the resultant effects and impact? Having identified through the BIA the resources that will be necessary, it is then of the utmost importance to identify what could prevent the provision of these resources in the required timeframe. You may have a recovery site some distance from your primary site, but what happens if your employees cannot get there, or if both your primary and backup sites are supplied from the same electrical substation? This will require a review of your resource needs and the possible risks that could affect their availability. It should be apparent that there can be no “cookie cutter” set of procedures for Risk Analysis and Business Impact Assessment. To try and use such an approach could be detrimental to an enterprise’s health. This is much the same as the “fill-in-the-blanks” approach to the development of a business continuity plan or the informational requests that are made for examples of plans, when the intent is really to adapt someone else’s plan for one’s own plan. Anyone thinking of this approach is doing a profound disservice for their organization and should not be reading this book. That is the reason this book is a guide to best practices. It is intended to provide the reader with an understanding of what could be involved in conducting both a Risk Analysis and Business Impact Assessment, and providing them with a means to identify what they need to do, as well as the sources of information to facilitate the process. Everyone undertaking a Risk Analysis and Business Impact Assessment seeks the silver bullet – a quick and simple way to complete the analysis. That is not possible, but the project can instead be broken down in such a way as to facilitate the analysis and start providing information quickly. Business continuity plans are based on information. Risk Analysis and Business Impact Assessment provide that information, and form the foundation of all plans. The key is to determine what information is needed and to stick with that. If not, the project can become so broad and time-consuming that it delays the development of the business continuity plan. Another problem is that the project is made so complicated that this same result occurs. An example is the use of probabilities or frequency. In the past much consideration was given to the chances of specific incidents occurring and the frequency of such occurrences. Since September 11, 2001, many business continuity professionals are rethinking that part of the analysis process. Many are now looking at it from the standpoint that the incident can occur and that the main concern is to determine what will be affected, and the resultant effect and impact. This ties in with the previous comments regarding quantification and qualification. A final aspect which needs consideration is the culture and structure of the company. The Risk Analysis and Business Impact Assessment must be tailored to fit that culture, not only in the amount and extent of the information needed, but also the way that the information will be gathered and the format in which it is to be presented. The key to a successful Risk Analysis and Business Impact Assessment is clarity in determining the objectives and the information-gathering process as well as the identification of the appropriate information sources, both internally and externally linked to a well-defined project management plan. Andrew’s book provides the business continuity practitioner with details of what should be considered, the information sources available, and the ways to structure and manage the project. Risk Analysis and Business Impact Assessment can be time consuming and require considerable effort, but the results can be instructive and valuable. At the end of the project you will have learned a lot more about your company – good luck! Melvyn Musson has over 25 years experience in disaster recovery, business continuity and crisis management. He is a charter member of the National Fire Protection Association NFPA 1600 Disaster Management Committee, and was also involved in the founding of both Disaster Recovery Institute International (DRII) and The Business Continuity Institute (BCI). He was Chairman of the DRII Certification Board during the initial development of the Professional Practices, and he continues to work in support of both DRII and BCI in the review and maintenance of the Professional Practices. Melvyn is currently the Business Continuity Planning Manager for Edward Jones, a leading financial institution (St. Louis, Missouri).